Peached Tortilla’s food truck is my butterfly. I have been stalking Peached Tortilla for months but cannot get my schedule to align with theirs for the life of me. Peached Tortilla is firstly, a food truck that does not stay in just one place. I salivate as follow their tweets and GPS coordinates and as I hear more friends boast how wonderful their experiences were. Sometimes as I drive about, I see the truck while I’m tragically stuck behind a light. When this happens, I gasp and forlornly touch my car window. Always followed by a very real sad sigh. Wednesday I was scanning my food twitter followings when I saw the lovely Optimista tweeting that Peached Tortilla is opening a standing location on UT campus. More importantly, the location is just one block from my building. I about fell over. The butterfly alighted upon me. The very next day and their very first day of operations, I happily walked myself over to their modest food cart, nestled so unassumingly between two local businesses. Really, it’s an alley. Work was very busy, so despite wanting to go overboard with my ordering, I only ordered a Banh Mi Slider and a Pad Thai Taco. I couldn’t afford a food coma. The food cost me a total of $5.50. The walk back to my office was tortuous. My boss had to see this new option to his usual university eats. When I got to my office, I took one bite of the Pad Thai Taco before remembering that he had to see. I took it over to him and he was astounded. “What. Is. This?” I gleefully broke the news to him that there’s a new food truck within walking distance of us and this is just a small example of their wonderful menu. The taste lingered in my mouth as I waited for him to finish taking in the smell of Pad Thai and Banh Mi. 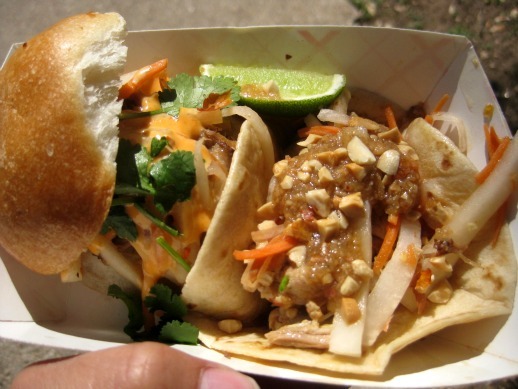 The Pad Thai taco delivered what was promised, a taco with fillings that taste liek Pad Thai. The added bonus were the pickled daikon and carrots. I’ve never had pad thai with these pickled vegetables and would have never thought it would be a winning combination, but it so is. The Banh Mi Slider. To make pork belly a Banh Mi sandwich? Genius. Pork belly was fatty and succulent, how it should always be. My fingers were fragrant from my lunch and it made me very reluctant to wash my hands. That’s how good this food is. I cannot wait to frequent this food cart again. Thank you, Peached Tortilla for finally landing within my reach.